We got a little snow last night so it has really put me in the Christmas spirit. I may even do some baking today. I’ve been putting it off as long as I can. I tend to bake too early. Taste what I’ve baked…until they are nearly gone. Then have to start all over again! I have zero willpower. At our house, we don’t put up a large Christmas tree. It wouldn’t last…much like this drawing! I do have 3 small trees that I keep on the hall table. They have homemade ornaments on them that I don’t care if they get destroyed. The day before yesterday, I picked up one of the trees three times … somebody (Lily, I’m sure) kept knocking it off the table. I’m sure it was an accident. She always looks so innocent! This might be my last post for the year. It’s going to be busy around here for the next few weeks. So I wish you all a very Merry Christmas and a Happy 2017. See you after the new year. Sharing with Sunday Sketches. Stop by and take a look at Alexandra’s Advent illustrations. They are adorable! Love your artwork - that's really lovely. haha ... yes, one is always hiding it seems!! Beautiful Xmas piece today, Merry Christmas Sue! That would be our cat, Luna. She's the shy one! Lovely tree! A very merry Christmas and a happy, healthy New Year to you and your family! Merry Christmas to you, too, Robin!! It was funny...the first time! love the drawing and I enjoyed the xmas tree mishap stories. wishing you well in the season. 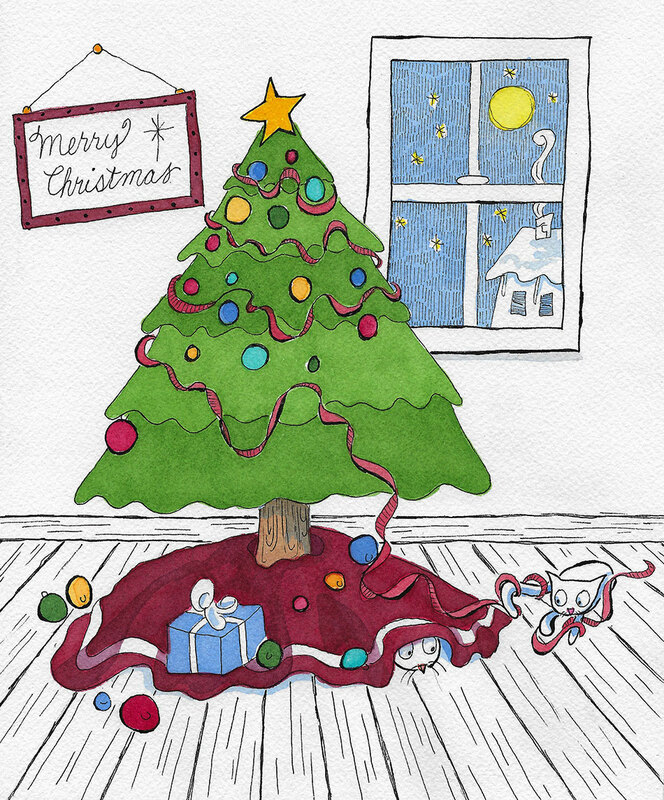 I love your christmas tree illustration! A Happy New Year to you and your family as well! Looking forward to seeing you in 2017! Here's hoping the new year will treat you well, have a happy and joyful ride into 2017! I hope you had a wonderful Christmas day. It snowed here. I love the scene out of the window. Wishing you a wonderful 2017 and looking forward to seeing your art on creative Tuesdays through the year, hopefully. Merry Christmas to you, dear Sue and lots of relaxing and cosy hours. I hope you are well and I'm looking forward to the day when you decide to continue with your blog. In the meantime I will remain patient and it's always great to have the pleasure scrolling up and down through your blog and enjoy your art you shared in the past.